Hey! 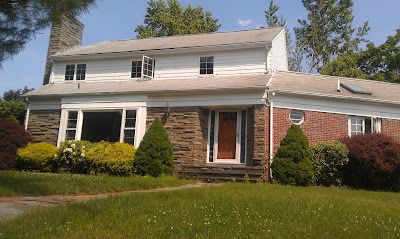 Since I started talking this week about my house, I figured you'd want to see what it looks like. So I will give you a tour of the first floor now, and save the second floor, the basement, and the yard for different posts. But first, a little background about our house search process. D landed his first job last February, and with both of us finally working full time, and saving money by living with his parents, we decided it would be a good time to start house hunting. We got approved by a bank, found a realtor, and started the process. We had talked with my parents a few times about our house searching, and a few weeks into looking, they mentioned to us that they wanted to move back up to this area from the Georgia/Florida border, as my dad was out of work with no opportunities in his field where they were living. So we talked it over and agreed that we would change some of our criteria to accommodate them living with us short term so that they could get back on their feet and my dad could find a job in this area. So, when we were house hunting, we knew that we wanted a house with at least three bedrooms, preferably with at least one of the bedrooms on the first level for my parents, first-floor access to a fenced backyard for my parents' dogs, and at least two full bathrooms. I also didn't want a split-level home, or a home on a double-yellow line road. Being as organized as I was, I had a spreadsheet with four different tabs: Want to See, No Longer Considering, No Longer Available, and Favorites/Still Considering. Each of those tabs had information about the property. Believe it or not, but we looked at over sixty houses in person and well over two thousand online before we decided to make an offer on the one we ended up purchasing. It was a very difficult search, but when we saw this house, we knew it was the one. And it was well worth the wait. But, I've left you hanging long enough. 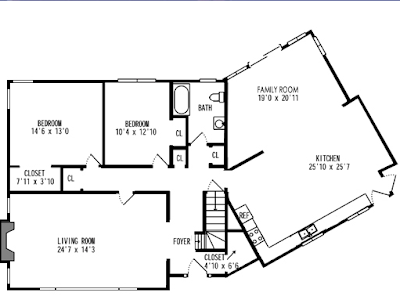 Here's the floor plan of the first floor. What's not shown here is that there is actually a 2-car garage on the side of the Kitchen/Family Room, and the sliding doors in the Family Room lead out to a deck and a fenced in yard. Now, here are some pictures. I know that some of them are small, but I didn't get pictures of every room when the house was empty, so you'll have to do with the professional ones from the listing. We use the entrance off the kitchen (garage is currently storage, no cars allowed), so I'll start the tour there. 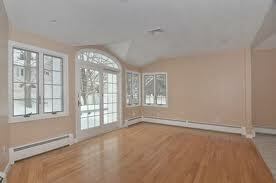 When you first walk in the house from the side porch, by the driveway and garage, you walk in to see this Family Room. We loved the windows and the arch above the door. 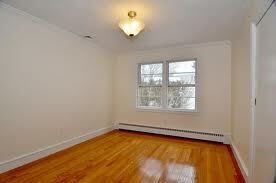 It lets in so much natural light, and the room is a really good size too. All of the floors on this floor of the house are either tile or original hardwoods - there is not a single wall-to-wall carpet, which we absolutely loved! When you turn around in the Family Room to face the door that you just entered the house through, this is what you see. The Family Room and Kitchen were a one-story addition to the house, which we believe was done in 1999, and for some reason, when they were putting in the floor, they thought it would be a good idea to put a hardwood inlay in the tile, right where you would put your kitchen table. We think this is really unattractive, and we plan to get rid of it when we remodel the kitchen, but that's probably five years down the line still. But we're dealing with it, but putting our table right in the middle of that inlay. You can see the start of some cabinets on the right side of the above picture, and that's the start of the kitchen itself. Here's where you can really see the size of the space. D hates white cabinets, but he let that slide since the kitchen will need remodeling in a few years anyway. 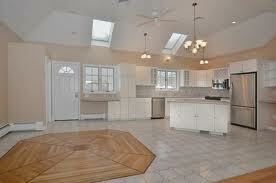 The island has space for 2-3 bar stools, and has cabinets all around for extra storage. And here's a closeup of the space between the island and the other cabinets. All of the stainless steel appliances came with the house, although they do have some dents in them. But that's to be expected from appliances that are at least 7 years old (the previous owner didn't upgrade anything in the house, so we can assume that these were here when he purchased it 7 years ago). 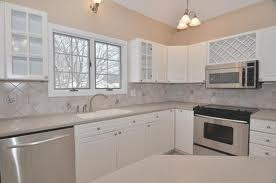 The countertops are Corian, which isn't my favorite, but for the most part, they are in good shape, so there is no overwhelming need to replace them right now, even though D nor I like the color. Now, if you notice from the floor plan, there is a pocket door to the right of the refrigerator that leads into the rest of the house. This pocket door is used every day, since we are only allowing the dogs to have access to the family room and kitchen. When you walk through the doorway, you reach the hallway. On the left, is the door to the basement, which we'll tour later, and on the right is a couple of closets and a full bathroom. 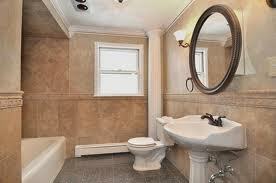 They did a really nice job with the remodeling of this bathroom, although it's not really our style. We may change some of it up in the future, and make it a little less brown, but that's not priority right now. 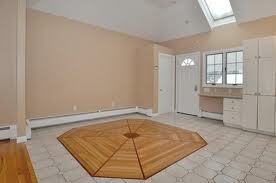 When you walk out of the bathroom and go right, there is the smaller of the two bedrooms on this floor. It looks really small in this picture, but it's big enough for a queen size bed and a dresser, so it's not actually that small. 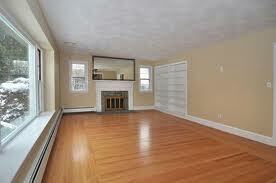 It also has a closet, which you can see the door to on the right side of the picture below. 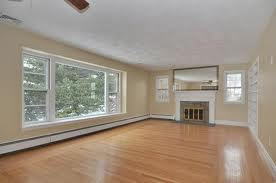 Unfortunately, I don't have a picture of the other bedroom empty, but it's similar to this one, larger in size, and has two corner windows instead of corners in the middle of a wall like this one. 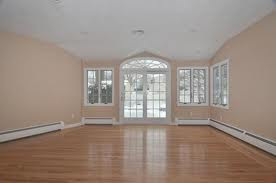 Also, it has bead-board around the entire room and has dark moulding, unlike the rest of the house, so eventually we will paint that white as well. That's a planned project that I'll get to likely this fall, so I'll make sure to get before pictures then. 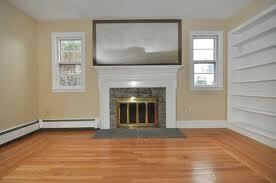 When you come out of the corner bedroom, there is a doorway in that hallway that leads to the Living Room. The Living Room is massive. 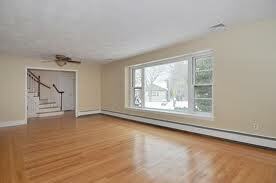 I'm pretty sure that before the Family Room/Kitchen addition, that this was two rooms. The first view from that doorway is of the large picture window that looks out at the Scotch Pines in the front yard. You can also see the staircase to the second floor in this picture. When you turn to the right, you can see the fireplace. This is a wood-burning fireplace, and to the right are some built-in bookcases, which will be very handy for knick-knacks and books. And here is a closeup of the fireplace. There is a large mirror plastered or glued to the wall above it, so while I think it's too large, I think we're going to keep it rather than risk taking it down and ruining the drywall. I'll likely just frame it with wood and cover up the tinted mirrored glass frame that you can currently see in the picture. When you turn around in that room and head out towards the front door, you see the staircase that leads up to the second floor. 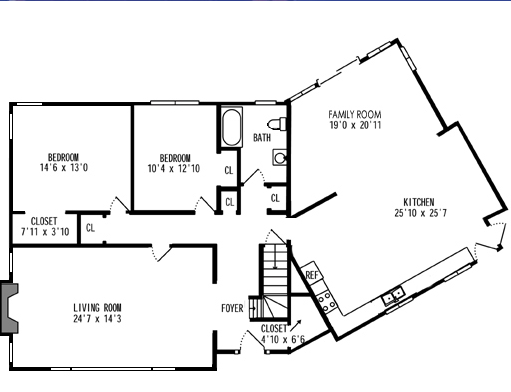 The brown door on the far right is the front door leading out to the front yard and walkway, and the other door is a coat closet, which you can see in the floor plan is rather large, and kind of oddly shaped. If you turn to the left and look down the hallway, you see the entryway to the Living Room on the far left, a sliver of dark on the left side, which is actually the smaller bedroom, a single-panel door that is a closet, and then a larger door set back in an alcove, and that's the full bathroom that I showed you earlier. And that, friends, is the first floor of our house. What do you think so far? I can't wait to show you the second floor. I know that you've gotten a little sneak peek at it, but I still think you're going to be shocked!